At a historic launch event held outside Johannesburg on April 21-23, 2017, almost 1,400 voting delegates from two-dozen unions representing 700,000 workers convened to launch the new “South African Federation of Trade Unions” (SAFTU). 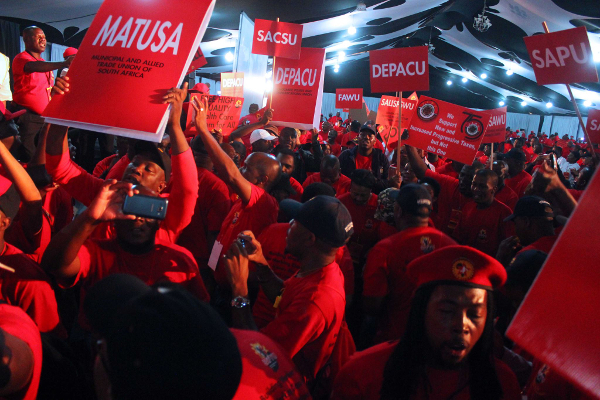 In addition to adopting the name, logo and colors — red, black and gold — delegates also endorsed a range of principles adopted at a preparatory “Workers’ Summit” convened by the National Union of Metalworkers of South Africa (NUMSA) in April 2016, adopted a new constitution, and approved a report from the Steering Committee proposing a range of campaigning priorities for the next period. At a TUED strategy meeting in New York in early April, Karl Cloete, NUMSA’s Deputy General Secretary, told union representatives from 12 countries that while the new federation’s campaigning priorities will focus on the many grave and urgent challenges facing South Africa’s highly exploited workers and exceptionally vulnerable poor, SAFTU would also make energy democracy and just transition part of its core agenda. We shall mobilize workers to oppose Eskom’s planned closure of five coal-powered power stations, which could produce 30-40,000 job losses, fight the partial privatization of Eskom by involving independent power producers, step up the campaign against nuclear energy and develop a position on transition to socially owned renewable energy. Other campaigning demands focus on challenging attacks on collective bargaining and trade union organizing, ending evictions of farm workers, improving access to healthcare and education, and making better use of pension funds to finance projects that benefit working people and their communities. Pending creation of SAFTU’s own website, the full text of the conference outcomes is available here. Rebuilding, block by block, new and vibrant collective relations within and between Unions from very different backgrounds and organizing cultures has offered a tantalizing glimpse of what can be achieved, not just in South Africa, but well beyond our borders — especially if internal democracy and accountability are practiced, genuine opportunities opened up to clarify thinking, and perhaps most importantly, the experience of working together on critical campaigns is built into the process. Learning from our mistakes, and not using them to score points or condemn has been crucial. Without wanting to exaggerate, the beginnings of a restoration of good old fashioned hope in the future has been achieved, against a backdrop of what might once have appeared to be insurmountable odds. Faulkner also reports that the organizers have established vibrant shop stewards councils in almost all nine of the country’s provinces, to help in reaching workers and communities who have been without democratic organization, representation and servicing for many years.